The Paschalion of the Orthodox Church is a set of rules for determining the date of Pascha that traditionally has been implemented by calendrical tables combining Metonic lunar cycles with the Julian solar year. The rules are attributed to the First Ecumenical Council (held at Nicea in 325); the cyclical Paschal tables that emerged in connection with the Council were based on 3rd and 4th century Alexandrian prototypes, and then transposed into Julian dates by Dionysius Exiguus in the 6th century. The origin of annual festivals in Christianity is obscure. St. Paul (1 Cor. 16.8) and St. Luke (Acts 2.1, 12.3, 20.6, 27.9) refer to Jewish annual festivals expecting their Gentile readers to know what is meant. Chapters 5-10 of John's Gospel is structured around the cycle of Jewish annual festivals, and all the Gospels' passion narratives are set at the time of Passover and the Feast of Unleavened Bread. But nowhere are Christian annual observances explicitly mentioned. Then, beginning in the mid-2nd century, evidence appears of Pascha and commemorations of martyrs. The commemorations of martyrs were held on fixed dates in the solar calendar. Pascha was computed according to a lunar calendar. This suggests the possibility that the annual Pascha celebration entered Christianity earlier than martyrs' festivals, and that it may have been part of Christianity's initial Jewish inheritance. Do not do your own computations, but instead observe Passover when your brethren from the circumcision do. If they err [in the computation], it is no matter to you. (1) ...the most holy festival of Easter should be everywhere celebrated on one and the same day. ...(So) cheerfully accept what is observed with such general unanimity of sentiment in the city of Rome, throughout Italy, Africa, all Egypt, Spain, France, Britain, Libya, the whole of Greece, and the dioceses of Asia, Pontus, and Cilicia; and (2) We have cast aside (the Jewish) way of calculating the date of the festival (because) ...we should never allow Easter to be kept twice in one and the same (solar) year! Thus, the old Quartodeciman custom of consulting the Jewish calculation of Nisan 14 and celebrating Pascha according to that date was formally rejected, and the independent computations long in use at the influential city of Alexandria became the emerging, if still somewhat controversial, consensus. On the other hand, the comments of canonists, preachers, and chroniclers indicate that the old custom of placing Easter in the month of Nisan as computed by the Jewish community continued to have adherents for generations. The Alexandrian and Roman methods of determining the date of Pascha were based on three principles: (1) Pascha was always after the vernal equinox, (2) it was to follow, but not coincide with, the first full moon of spring, and (3) it was always to be on a Sunday. A fourth principle – and one enunciated following Nicea I – is implicit in the first three: namely, (4) the date of Pascha was not to depend on the Jewish dates for Passover in any way. This last criterion was met by formulating the Paschalion entirely in terms of astronomical events and the weekly cycle of days. Since we keep the first of times (spring), and the equinox ("isimera"), and after this the fourteenth of the moon, and together with these the three days Friday, Saturday, and Sunday; lacking any of these at one time it is impossible to fulfill the Pascha. A traditional Paschalion of three elements is set forth in this homily attributed to St. Chrysostom. Its actual operation is clarified by the following passage from a letter traditionally attributed to St. Ambrose, most probably dating from the year 386 when Alexandrian and Roman dates for Pascha did not match, and St. Ambrose chose to follow the Alexandrian date. We must keep the law regarding Easter in such a way that we do not observe the fourteenth as the day of the Resurrection; that day or one very close to it is the day of the passion...[and] it is evident that the day of the Resurrection should be kept after the day of the Passion, [so] the former should not be on the fourteenth of the [lunar] month, but later. Despite evident divergences in dating Pascha, the basic intention of the Nicene Fathers is conveyed by these late fourth century texts. In summary, that intention was to establish a simple set of rules that would allow Pascha to be dated independently of the Jewish calendar, and to ensure that the basic chronological sequence of Passion and Resurrection as recorded in the Gospels was imitated every year. Insisting on Sunday as the only day suited to commemorating the Resurrection reveals their intention to imitate the chronology of the original event; and their preference for an astronomically determined vernal equinox is evident from the Eastern Church’s early adoption of the Alexandrian Paschal computations based on March 21st rather than March 25th, the conventional date of the vernal equinox on the official Julian and Alexandrian calendars. The emergence of differing tabular, computational systems intended to implement the Nicene rules was a complex historical process, leading to the eventual dominance of a system based on calendrical experiments made at Alexandria beginning in the mid-3rd century. According to this system, Pascha is the first Sunday following the date of the Paschal Full Moon (PFM - also called the νομικον φασκα, "nomikon faska" in Greek) for a given year. The computational PFM is not, however, the first full moon following the vernal equinox as determined by direct observation or by accurate astronomical computations. Rather, the computational PFM is designated as the first Ecclesiastical Full Moon (EFM) date that falls on or after March 21 on the Julian calendar. Ecclesiastical Full Moons (EFM) are calendar dates that approximate astronomical full moons using a cycle that repeats every 19 years. March 21 (O.S.Julian) was the date used by the Alexandrians for determining the EFM used in their Paschal tables because it was near the actual date of the vernal equinox in the late 3rd and early 4th century A.D., when Paschal tables were first being compiled. The decision of the Nicene council concerning Pascha was that it should be computed independently of any Jewish computations: hence, a Paschalion that is consistent with Nicene principles cannot have any built-in dependence on the Jewish calendar. Nevertheless, possibly as early as the 12th century and certainly in recent times it has been widely believed that Christian Pascha is required always to follow, and never coincide with, the first day of Passover, which is Nisan 15 in the rabbinic Jewish calendar. By the 12th century the errors in the Julian calendar's equinoctial date and age of the moon had accumulated to the degree that Pascha did, in fact, always follow Jewish Nisan 15. This state of affairs continues to the present day, even though the Jewish calendar suffers from a slight solar drift of its own, because the Julian calendar's errors accumulate more rapidly than the Jewish calendar's. Thus, Zonaras apparently reads the force of the words "Spring equinox" out of the canon entirely, even though he does not abbreviate the text of Canon 7 the way Aristenus (prior to Zonaras) had done by omitting the words entirely. So what Zonaras probably means is that the astronomical (or computational) vernal equinox is the "something else" known to the "wise Apostles" which makes both proposed calendrical dates incorrect, and the12th century practice of the Church canonical. Because Zonaras saw no reason to be worried about celebrating Pascha before the vernal equinox, he then treated the idea of not celebrating Pascha along with the Jewish Passover as a separate rule. Even so, he (or perhaps Balsamon after him) adds the proviso "that is, on the same day" in an effort to prevent anyone from taking "with the Jews" to mean celebrating Pascha as though it were part of the Jewish feast. Hence, what not being on the same day/date means in practice is not letting the date of Passover determine the date of Pascha. So Zonaras may well be saying nothing new, though his words have been widely taken in an innovative sense. The final seeming novelty of Zonaras's commentary is the idea that Pascha is supposed to follow Passover, or at least, "it is fitting" that such a sequence is observed. This, of course, is what necessarily happens whenever the Nicene paschalion is correctly followed, provided "Passover" is understood to mean the one day of 14 Nisan (or 15 Nisan in rabbinic practice) and not the entire eight-day feast of Passover which includes the Feast of Unleavened Bread. But when the dates of Pascha are derived from an inaccurate tabular computation, it could well happen that the day of Pascha would be the same day as the Passover - even though each date was independently calculated. It is this latter situation that Zonaras and his readers were apparently trying to cope with, in their different ways. For what Zonaras says can be taken to mean something like the following: "Their feast - which is no feast - is done first; and thus we do our Pascha [as the perfection of what has gone before in history and has lapsed in grace]." On this understanding, postponing Pascha to avoid its coinciding with the date of Passover would implicitly acknowledge a continuing validity for the Jewish feast, and violate Canon 7 by letting Jewish practice (in a limited, but real sense) sometimes determine the date of Pascha. Many who read this in Zonaras, however, saw only a mandated sequence of separate dates. The 14th-century canon lawyer Matthew Blastares also enumerated the paschalion's principles in a way that can be taken to require dependence on the Jewish calendar. First, that it is necessary to celebrate the Pascha after the spring equinox; second, that it is not the same day as the Jewish festival; third, that it is not merely after the equinox, but after the first full moon following the equinox; and fourth, that (it is) the Sunday immediately after the full moon." If by "the Jewish festival" Blastares simply meant the Paschal Full Moon, then his second principle would be redundant - merely restating the third principle in other words - if it were not for the known divergence between the astronomical Pascal Full Moon and the Ecclesiastical Full Moon. If, on the other hand, he meant the 15th of Nisan on the Rabbinic Jewish calendar (which date for Passover apparently began to supplant 14 Nisan in Inter-testamental times) then, as Zonaras may have done before him, he seemingly has replaced the Nicene rule of independence from the Jewish calendar with a rule that the paschalion must instead depend on it - in order to shun a coincidence of dates. However, it is also possible Blastares (like Zonaras before him) may have meant in his second rule that the date of Pascha is not set by simply adopting the date of Passover, as was the practice of the Quartodeciman churches prior to, and for some time after, the Nicene paschalion was enunciated. If this is the case, he too is saying nothing new. The following table shows the Julian and Gregorian calendar date of the Julian Paschal Full Moon (PFM) for each year of the 19-year cycle. To determine the position of a given year in the 19-year cycle, add 1 to the A.D. number of the year and divide by 19. The remainder is the year's position in the cycle. If there is no remainder, the year is the 19th of the cycle. Hence 1994 was year 19 of its cycle, and 1995 was year 1 of its cycle. The Gregorian calendar equivalences are valid from 1900 to 2099. Pascha is always the Sunday following the Paschal Full Moon. Since the PFM is simply the 14th day of the Paschal lunar month, this means that Pascha is the third Sunday in the Paschal lunar month, and can fall on any date in the lunar month from the 15th (the day after the PFM) to the 21st (seven days after the PFM). That the structure of the Paschal lunar month is modelled on that of the scriptural month of 'Aviv (now called Nisan) should be clear. The Paschal lunar month is analogous to the month of 'Aviv. It is in effect a Christian 'Aviv or Nisan'. The 14th day, the Paschal Full Moon, is analogous to the day of the Passover sacrifice, and the third week, the 15th to the 21st, the week whose Lord's Day is Pascha, is analogous to the Week of Unleavened Bread. Because of the inaccuracy of the Julian Calendar's solar year, Pascha is drifting later into the year for those who use the Julian Paschalion. Even though for those using the Julian Calendar Pascha will always be sometime in March or April, it will eventually be celebrated in the northern hemisphere in the summer, the autumn, and then the winter. For those using the Revised Julian Calendar, the calendar date of Pascha is drifting along with its astronomical position. In both cases, however, the drift is very slow compared to human lifetimes - it amounts to approximately one week every 1000 years. So, for example, it would take an amount of time longer than all recorded history just for Pascha to end up being celebrated after the summer solstice in the northern hemisphere. Additionally the Julian Ecclesiastical Full Moons are deviating further with time from the astronomical full moons: The EFM now falls 3 to 5 days after the corresponding astronomical full moon (see table). The Gregorian Calendar, which includes its own revised Paschalion, has neither of these problems. In the 14th century Nicephoras Gregoras calculated the current error in dating the vernal equinox to be three days, and proposed a reform of the Julian calendar to Andronicus II. The reform was not adopted, apparently from lack of popular or political support; and in fact would have corrected less than half of the seven-day error that actually existed at that time. In October 1582, the Roman Catholic Church adopted a major calendar reform designed to correct the Julian calendar's defects. The Julian calendar then in common use was based on an average year of 365.25 days, slightly longer than the mean tropical year of 365.2422 days and the mean vernal equinox year of 365.2424 days. Since 19 Julian years were taken to be equal to 235 lunar months, the average lunar month in the Julian calendar was 29.530851 days, somewhat longer than the astronomical mean synodic month of 29.530589 days. The new calendar eliminated the 10-day drift in the vernal equinox, and the 3-to-4 day deviation in the age of the moon, that had accumulated since the Julian Paschalion had come into use, and laid down rules that would slow the rate of accumulation of errors in the future. The new calendar was called the Gregorian after its sponsor, Pope Gregory XIII, and Eastern churches refused to adopt it on the grounds that the new Roman tables sometimes placed Pascha on the day of the vernal full moon, instead of after it as the Nicene principles required. In 1583 the Council of Constantinople forbade use of the new calendar and Paschalion, making adherence to the Julian calendar a test of Orthodoxy in territories where Roman Catholic Uniate churches were being established. A congress of Orthodox bishops meeting in 1923 under the presidency of Patriarch Meletios IV agreed to set Pascha by means of precise astronomical computations referred to the meridian of Jerusalem, using a midnight to midnight day to date the full moon. This agreement was never permanently implemented in any Orthodox diocese. But the Revised Julian calendar, a more accurate version of the Gregorian calendar, which was introduced by the same congress has been adopted by some jurisdictions for celebrating the fixed feasts of the liturgical year. A consultation of Catholic, Orthodox and Protestant delegates met in Aleppo, Syria and issued an agreed statement recommending that all member churches work toward a common method of dating Pascha based on the three original Nicene principles, but employing astronomical observations from the meridian of Jerusalem instead of any cyclical tabular computation. This was essentially the same proposal as that of 1923, and was not implemented in the proposed year of 2001 when Eastern and Western dates for Pascha coincided. Resistance to such a reform by Orthodox jurisdictions is apparently rooted in respect for a widespread belief that March 21st Julian was designated by the Nicene Fathers to be the only true vernal equinox, and nourished by persistent fears that changing the received tradition for dating Pascha would endanger the integrity Orthodoxy’s witness to the Patristic Tradition by creating a purely “cosmetic” unity with other Churches. And so it is that the Nicene paschalion continues to be differently implemented in practice, despite its original simplicity. The Roman Catholic and Protestant West eventually adopted the Gregorian Calendar for civil and ecclesiastical purposes, including the determination of Pascha. The Orthodox East, however, was not so quick to change. Even when the traditionally Orthodox countries began to adopt the Gregorian Calendar for civil purposes, the Orthodox Church retained the Julian Calendar and original Paschalion. For the sake of convenience, the date of Pascha is often transposed to the coincident date on the Gregorian Calendar for reference. Because of the difference in calendars and formulas, Western Easter and Orthodox Pascha do not often coincide. Under current rules, they can differ from each other by 0, 1, 4, or 5 weeks. They are in separate lunations (meaning that they are 4 or 5 weeks apart because their respective cycles identify different lunar months as the Paschal lunar month) in years 3, 8, 11, 14, and 19 of the 19-year cycle, and in the same lunation (0 or 1 week apart) in the other years. N.B. -- In this formula MOD is the modulus function, in which the first number is divided by the second and only the remainder is returned. Further, all division is integer division, in which remainders are discarded. Thus 22 MOD 7 = 1 but 22 / 7 = 3. Easter Month will be a number corresponding to a calendar month (e.g., 4 = April) and Easter Day will be the day of that month. Note that this returns the date of Pascha on the Julian calendar. To get the corresponding date on the Gregorian calendar, add 13 days (14 days after March 1, 2100). This site allows the user to enter a year and uses Oudin's algorithm to compute the relevant dates. Although the Orthodox (Julian-based) formulas are used, the utility returns the corresponding Gregorian calendar dates. 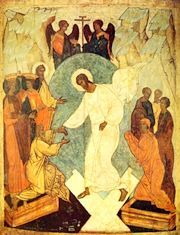 For example, in 2006 Pascha falls on Sunday, April 10, on the Julian calendar. That date corresponds to April 23 on the Gregorian calendar. A perpetual Paschalion utility is available here. The utility was created by Aleksandr Andreev of Duke University and calculates Pascha and associated feasts for any series of years. It also calculates the numbers used in Paschal calculations which can be found in an Orthodox Typicon. 1. See http://www.tertullian.org/fathers/dionysius_exiguus_easter_01.htm for the Paschal cycle of Dionysius; and http://en.wikipedia.org/wiki/Dionysius_Exiguus for an account of the transposition. 3. Eusebius, Vita Constantine III:18-20, Nicene and Post-Nicene Fathers, Vol. 14, pp. 54-55. Also available at http://www.fourthcentury.com/index.php/urkunde-26. 4. James Campbell, “The Paschalion: An Icon of Time,” St. Vladimir’s Theological Quarterly, Vol. 28 No. 4 (1984) pp. 245-262. Also available at https://www.academia.edu/8246608/The_Paschalion_An_Icon_of_Time. 5. Chrysostom, Paschal Homily VII, Migne, Patrologiae graecae Vol. 59, col. 747A. 6. Hefele, History of the Councils, Vol. I., pp. 328ff. 7. Ambrose, Letter to the Bishop of Amelia, Fathers of the Church Vol. 26, pp. 193-194 and 199. Latin text: Migne PL 16, 1073B and 1078A. 8. Until the 6th century the Paschal tables used in Rome were based on the conventional date of March 25th for the vernal equinox. See Jones, “The Development of the Latin Ecclesiastical Calendar” in Bedae, Opera de Temporibus (1943) pp.1-104 for an English overview, or a more detailed account in French s.v. “Paques. les controverses pascales” in Dictionnaire de Theologie Catholique (1931) Tome 11.2,1948-70; also available at http://jesusmarie.free.fr/dictionnaire_de_theologie_catholique_lettre_P.html. Please note that Hefele (note 5 above) differs from my more recent sources in saying that in 387 the Romans took March 18 as the vernal equinox in order to arrive at Pascha on March 21. It seems possible that the discrepancy involved the Romans having relied on their tabular EFM date regardless the equinox. This, of course, would have been a very serious breach of the Nicene principles. 9. The basic system can be found in the “Paschal Canon” of the Alexandrian scholar Anatolius, Bishop of Laodicea, which was composed c. 277 A.D. See http://www.ccel.org/ccel/schaff/anf06.vi.iii.ii.i.html and following pages. 10. The Rudder, Apostolic Canon 7, available at http://www.holytrinitymission.org/books/english/cannons_apostles_rudder.htm . Also The Rudder, Cummings ed. (Chicago: The Orthodox Christian Education Society, 1957). The Rudder's words "after the Passover of the Jews" may simply refer to the astronomical Paschal Full Moon, not to any date in the Jewish calendar. In practice, it is often understood to mean the 15th of Nisan in the Rabbinic Jewish calendar. See for example http://orthodoxwitness.org/over-the-rooftops/how-the-date-of-pascha-is-determined/2/ (Last visited April 15, 2015) where the author states that Pascha in 2015 is set to April 12 2015 to avoid coinciding with "the Jewish Passover" which he dates (incorrectly) to April 5, and that Pascha 2016 is set to May 1 to avoid coinciding with the Jewish Passover which he dates to April 22. This last date corresponds to 14 (not 15) Nisan 5776 and so is the Jewish Passover in a strict sense, but April 22, 2015 is a Friday, not a Sunday. In any case, the author clearly uses "Jewish Passover" to refer to a date on the Jewish calendar, and not to the paschalion's Paschal Full Moon, which falls on Tuesday, April 7 in 2015 and on Tuesday, April 26 in 2016. 11. Joannes Zonaras, Commentary on Apostolic Canon 7, Migne, PG 137, 49-50. Ἐαρινὴν ἰσημερίαν τινὲς τὴν κε᾽ φασὶ τοῦ Μαρτίου· τινὲς δἐ τὴν κε᾽ τοῦ Ἀπριλλίου. Οῖμαι δὲ μήτ᾽ ἐκείνην μήτε ταυτην τὸν κανόνα λέγειν· ὡς ὲπι τὸ πολὺ γὰρ τὸ Πάσχα πρὸ τῆς κε᾽ τοῦ Ἀπριλλίου ἑορτάζεσθαι είωθεν· ἔστι δὲ ὅτε καὶ πρὸ τῆσ κε᾽ τοῦ Μαρτίου, ὡς συμβαίνειν (εἰ οὔτως νοοϊτο ἡ ἐαρινὴ ἰσημερία) παρὰ τὸν κανόνα τοῦτον τὸ Πάσχα ἑορτάζεσθαι. Ἔοικεν οὐν ἄλλο τι ἐαρινὴν ἰσεμερίαν τοὺς συνετοὺς ἀποστόλους ὀνομάζειν. Ἡ δὲ πᾶσα τοῦ κανόνα, διαταγὴ τοῦτό ὲστι, τὸ μὴ μετὰ Ἰουδαίων (ἤγουν κατ᾽ αὐτὴν τὴν ἡμέραν) ἑορτάζειν τὀ Πάσχα Χριστιανούς. Χρὴ γὰρ προηγεϊσθαι τὴν ανέορτον ἐκείνων ἑορτὴν, καὶ οὕτω τὸ καθ᾽ ἡμᾶς τελεϊσθαι Πάσχα. Ὁ δὲ μὴ τοῦτο ποιῶν ἱερομένο, καθαιρεθήσεται. Τοὺτο δὲ καὶ ἡ ἐν Ἀντιοχείᾳ σύνοδος ἐν πρώτῳ κανόνι διετάξατο, λέγουσα τῆς ἐν Νικαίᾳ πρώτης συνόδου ὄρον εὶναι περὶ τῆς ἑορτῆς τοῦ Πάσχα· εἰ καὶ μὴ εὑρισκεται ὲν τοῖς κανόσι τῆσ ἐν Νικαίᾳ συνόδου τοιοῦτος κανών. Please note, this text has been translated into English from the Latin parallel translation found in Migne, PG 137. 12. Aristenus, Commentary on Apostolic Canon 7, Migne, PG 137, 50. 13. Matthew Blastaris, Syntagma Alphabeticum, Migne, PG 145, 96D-97A. 14. See Guiland, Essai sur Nicephore Gregoras (Paris: P. Geuthner, 1926), pp. 282-284. Also, Dictionnaire de Théogogie Catholique (Paris, 1911) Tome 11, col. 455; and Welborn, "Calendar Reform in the 13th Century" (Chicago: University of Chicago Dissertation, 1935), p. 31. 15. M. Milankovitch, "Das Ende des julianischen Kalenders und der neue Kalender der orientalischen Kirchen", Astronomische Nachrichten 220, 379-384(1924). 16. See World Council of Churches / Middle East Council of Churches Consultation, “Towards a Common Date for Easter” (1997); available at http://www.oikoumene.org/en/resources/documents/wcc-commissions/faith-and-order-commission/i-unity-the-church-and-its-mission/towards-a-common-date-for-easter/index?set_language=en. 17. For an example of this, see Fr. Luke Luhl, “The Proposal for a Common Date to Celebrate Pascha and Easter,” Orthodox Christian Information Center (1997); available at http://orthodoxinfo.com/ecumenism/common_luhl.aspx. This page was last edited on May 6, 2015, at 14:02. This page has been accessed 79,604 times.